The civil-justice literature is replete with discussions of two phenomena: case management and the vanishing trial. These two phenomena are not unrelated. One commonly state goal of case management is to find ways, other than trial, to resolve civil disputes that find their way into court. Some observers find the movements toward case management and away from trial to be salutary; others find them disquieting. Regardless of the merits of this debate, the delivery of civil justice is undeniably evolving. This evolution affects and changes many of the traditional attributes of American-style civil justice. The Essay examines one of these attributes: oral argument.. 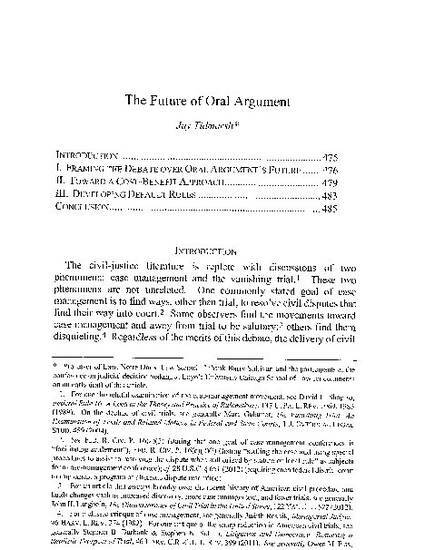 Although this Essay occasionally mentions oral argument at the appellate level, its specific focus is oral argument in the court of first instance—the trial court. To the extent that "form follows function," the combination of case management and the vanishing trial makes one of the law's oldest forms—oral argument before the trial judge—largely unnecessary.